Tuscany Suites & Casino is an all-suites property just off Strip with 27 acres of lush landscape, pools, and fountains. 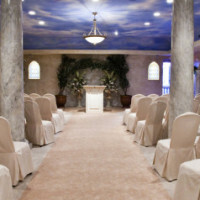 The property has a chapel with Tuscan-style decor and a fresco ceiling for wedding ceremonies. Ballrooms host more traditional wedding receptions. Catering minimums are $25 for lunch, $35 for dinner. A private dining room with a can host 80 guests, for $250, serving menus from the Mexican restaurant or casual cafe from $12.95 per person. Tuscany Gardens restaurant is also available for buyouts with menus from $35-55 per person. The highlight at Eastside Cannery is One Six Sky Lounge, a modern nightclub style reception space for up to 325 guests with great views of Las Vegas. An array of ballrooms seat 50-350 for more traditional wedding receptions and poolside weddings are possible as well. Catering available for plated and buffet dinners with hors d’oeuvres, actions stations and more from $35 per person. See real weddings at Eastside Cannery featured on Little Vegas Wedding. This Italian chain has two locations in Las Vegas, but only the location on the south Strip at Town Square is able to host wedding receptions of up to 72 in two private dining rooms featuring romantic Italian villa decor. Fogo de Chão is a Brazilian churrascaria or steakhouse just a little east of The Strip. 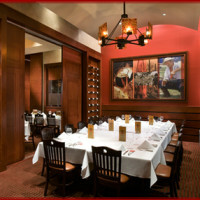 With nine private and semi-private dining room options, they can host up to 200 people at the Las Vegas location. Group dining is provided for wedding receptions of 15 guests or more, and include a prix fixe menu with 16 varieties of beef, pork, lamb and chicken, plus salad and sides served table side on sizzling skewers by gaucho chefs. Open bar packages available. Bootlegger Bistro is a restaurant just 5 minutes drive south of Mandalay Bay, with two venues suitable for wedding ceremonies, receptions and banquets: The Vegas Room (hosts 50 guests) and nightclub-style Copa Room (hosts up to 300.) 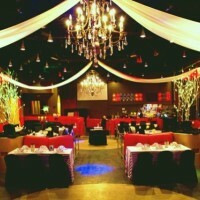 The Copa Room boasts chandeliers and dramatic lighting, elegant draping and banquette seating. Venue rental fee includes four hours of rental plus all furniture, china, linens, house florals, A/V equipment and entertainment system, lighting and more. Catering features Italian, tapas and continental dining options. Bar packages are from $21 per person. 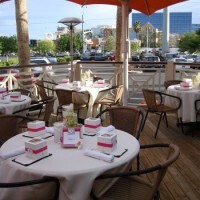 See real weddings at Bootlegger Bistro featured on Little Vegas Wedding. 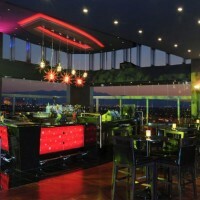 LUX is a special event venue perched 16 floors up at the top of the modern M Resort, with views of the Las Vegas valley. 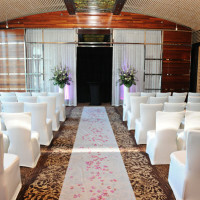 The impressive contemporary space is capable of hosting both a ceremonies and receptions, and has an outdoor terrace. All inclusive reception packages include bar services, cocktail reception and dinner. There are also less expensive lunch packages available. Impressive add ons include digital photo projection on the elevators as guests arrive, lighting packages and specialty cocktails. See real weddings and engagements at LUX at M Resort featured on Little Vegas Wedding. Escape to the islands at Bahama Breeze. This restaurant offers a Caribbean atmosphere with fresh cuisine and handcrafted drinks just a short taxi ride off The Strip. 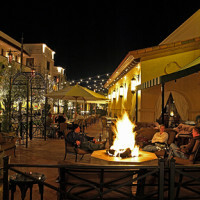 Cocktail parties from $28 per person, Dinners from $31-50 per person. Live music, desserts and signature drinks available as add ons. Cash bar, limited bar and open bars are possible.